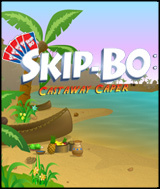 Explore a remote island teeming with SKIP-BO™ fun in SKIP-BO: Castaway Caper™! After your ship washes up on the shore of a seemingly deserted island, it quickly becomes clear that the island is not only inhabited, but that it is also home to a powerful volcano. Your presence has awoken and angered the volcano and put the entire island in jeopardy. Fortunately, the islanders are masters at the great game of SKIP-BO™ and are willing to teach you their favorite game. Only you can play SKIP-BO™ with the friendly inhabitants of the island, calm the active volcano, and restore the quiet peace of this tropical paradise. With four unique game modes, challenging mini-games, and endless, family-friendly SKIP-BO™ fun, SKIP-BO: Castaway Caper™ is an original adventure featuring one of the world's favorite card games. Comments: I played this card game with family for years. Now I can relive the memories playing it here. Its wonderful to have a game that means so much to play when I need a dose of family that is out of town. Comments: I had never played the card game before and found the computer game to be a good way to learn the game.